Going into my first triathlon of the season, I was pretty nervous. A new, longer distance, a few training road bumps, and an intimidating weather forecast had me a bit worried last week. Today’s post is basically a recap of the race. I also need to do a post thanking and recognizing all who got me here! It truly takes a village! The race was located in Lawrence, Kansas, which is about 40 minutes away from where my in-laws live. On Saturday morning my husband and I drove over to pick up the packet and check out the course. At check-in, I notice that they have me down for the wrong race, the 70.3 instead of the 100 mile race (a very mean temptation when I was already nervous about the 100!). I wait in a line to get that switched and feel a bit uneasy about it because they switched my number and scribbled the change down on a piece of notebook paper. When I make my way back over to the packet pickup, they call me Julie. I have to explain again that they just assigned me this new number, they assure me it will get changed. After that, we talk to someone from a local bike store about the course. He had no affiliation with the race but was giving people more information about the course than anyone else there. After that we head out to drive the bike course and I realize that I underestimated the hills in Kansas. I was worried about having to walk my bike up a couple of the hills I saw. Yikes. After getting back to my in-laws house, I begin to go through the information in the packet and notice that I don’t have a timing chip. I look for a phone number on the website, my e-mails, etc but there was no phone number given. Then on the race’s Facebook page there is a phone number given, I call it and someone answers “Pizza Shuttle”. Wrong number…. So then I send an e-mail, hoping that I will hear back about the timing chip quickly to avoid having to drive another hour and a half round trip. As the afternoon wore on and I didn’t hear, we decided to drive back and get the timing chip. The timing chips were in a separate tent, hidden behind a shack where they were selling t-shirts. And no one mentioned this to us in the morning when we were there. Frustration was growing. We planned to arrive pretty early Sunday morning. Transition was open from 5:00-6:15 and races started at 6:30 AM. We entered the park at about 5:10AM, immediately in a long line of cars waiting to park. As there was only one road going in and Kansas had lots of rain the week prior, parking was a mess. And took FOREVER….Add to that a long walk to transition (close to a mile). It was 6:15 and we were still walking down the hill to transition (as were lots of others). I quickly set up transition and got to the start about 3 minutes before my wave began. SWIM- 2 Miles. Time 1:12:08 Choppy. Crowded. That’s probably all I really need to say about it. It was the roughest waters I’ve ever attempted to swim in. The course was a mile rectangle that you swam twice, but had to get out of the water and go around a dock to start the second lap. Going out the first lap was really choppy, but eventually I got used to it. Then the second lap was extremely crowded as some of the other shorter races were starting at the same time. I got hit and kicked a lot. And it was still choppy. Eventually the swim ended. It was slower than I’d have liked, but I’m pretty happy with how I handled more challenging conditions than I’ve ever been in. Not my best breathing technique……Let’s say I was sighting here. T1- 3:44 I took my time a lot more in transitions for this race than in my previous ones. I wanted to make sure I got everything right, not forgetting nutrition or anything like that. In hindsight, I could have sped up more….My bike was also racked at one of the farthest points away from the Bike Out/In part of transition so it was a lot of navigating around other people. BIKE- 80 miles. Time 5:04:40. Average speed 15.8 mph In the first minute of the bike I looked down to see that my bike computer wasn’t working. It was measuring cadence, but not speed or distance. I knew I could stop and adjust the sensor and get it working quickly, but decided just to go with it. I had my Garmin 920 watch on. It showed me my average speed for each lap (5 miles), so I had a decent idea but not constant feedback like I do with my bike computer. I decided it may be a good thing to ride more by feel and not worry about the numbers so much. This is just after getting on the bike. Nutrition perked me up shortly after! The bike course was really beautiful country roads, but definitely hillier than what I’m used to. I can say with certainty that I rode the steepest and longest hills of my life in this race. But I made it up each of them. I focused on trying to keep a pretty even effort and just getting in whatever gear I needed to do that. The highlight of the bike course came on a hill. There was another woman who had passed me twice, only to have me pass again. When I passed her the last time (on an uphill), she said “You are a billy goat!”. As a rider who doesn’t really feel confident on hills, this was really the best thing anyone could have said to me! Aside from the hills, there were also winds. I’ve seen people saying 20 mph. In the month of May I had two long bike rides: 100 miles and 82 miles. Both were extremely windy and helped Sunday seem more bearable. The final miles of the bike featured some of the most challenging hills of the course for me. I was happy to have made it up them and ready to be off the bike. These pictures are all in the last mile of the bike course, happy to have the hills and wind behind me! T2- 6:58 Not sure what the chances of this are, but the two people who I finished the bike course with were on either side of me in transition. We briefly chatted about the tough bike course, how the run was going to involve more walking than we wanted and sunscreen. I counted on sunscreen being applied in transition like the pre-race information said but hadn’t seen it. The girl next to me was kind enough to share some sunscreen because I knew I needed to re-apply and had sent my sunscreen with my husband before the start of the race. Getting compression socks on at this point was a slow process, but I’m glad I did. I should probably work on faster transitions for my next race. RUN- 18 miles. Time 3:23:40. Average pace 11:19/mile. Hot. Humid. Sunny. Walk/Run Combination. Again, I could probably just say that. The run course was a 3 loop course through the park with little shade. As temps reached 94 in the afternoon it was hot. The wind we had battled on the bike was basically all blocked on the run so there was little breeze. I knew immediately that any time goals were out the window and just focused on forward movement. My first miles were brutal and I really thought I would be walking the majority of the 18 miles. As the course wound through the park, I was pleasantly surprised to find numerous campsites where people had hoses hooked up and were patiently standing there all afternoon spraying runners. Walkers. Whatever we were at that point. This may really be the game changer that got me through the race. I took full advantage every time I passed one of these good samaritans with a hose. Because of the looped nature of the course, I was able to see my cheer squad, as well as a few friends also on the course competing multiple times through the afternoon. That was nice. In different conditions, this race could have been so fun! View of part of the run course. This is at about mile 5 of the run. One of many amazing aid stations. SO many great volunteers got me through this race. One of many walks of shame that day! Mile 15. At this point I’ve added a wet towel around my neck. LIFESAVER!!!! Last half mile. So ready to be done! And finally the finish! 100 miles- DONE! TEACHER GRADING SCALE: Swim– B+ I could have had better form to have had more speed, but given the conditions this was a good swim for me. Transitions– C- Ok. I really just got lazy in the transitions on this race and wasn’t really rushing. Bike– B+ I’d like to have more experience on hills, in wind and long distances. This will come with time. Run– A-/B+ While I didn’t come anywhere close to the time I typically do on long runs, just being able to do some combination of running and walking on this day was an accomplishment. In hindsight I think I could have run a bit more than I did, but overall I’m pleased with it. Nutrition– A+ I feel like I really nailed nutrition this race. Leading up to the race I did a healthy fat load, followed by a carb load, as recommended by this book. I kept very careful intervals on the bike where I was taking in nutrition. This kept me from being in deficit on the run. On the run I was still pretty methodical about my nutrition, taking it in at very specific intervals, but I also added in stuff from the aid stations as needed. I really don’t feel like my energy stores were ever in the tank, and aside from the heat, feel like I was pretty consistent the whole race. 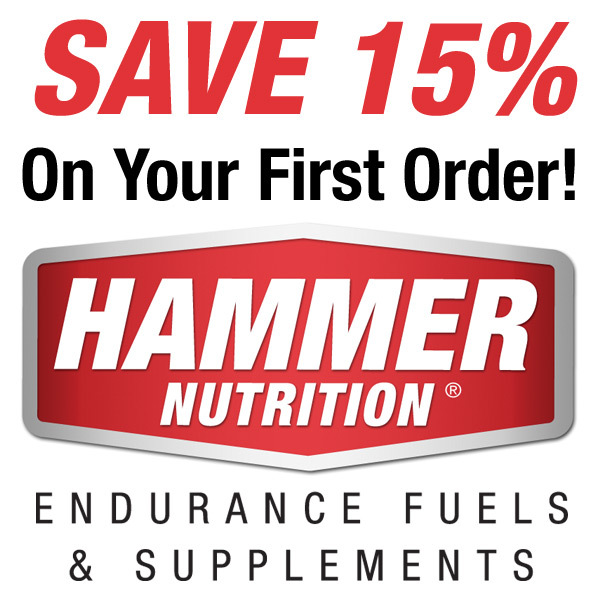 A huge thanks to Hammer Nutrition for providing me with such great products. I used Perpetuem and Montana Huckleberry gels on the bike, Fizz and Chocolate and Peanut Butter Chocolate on the run. 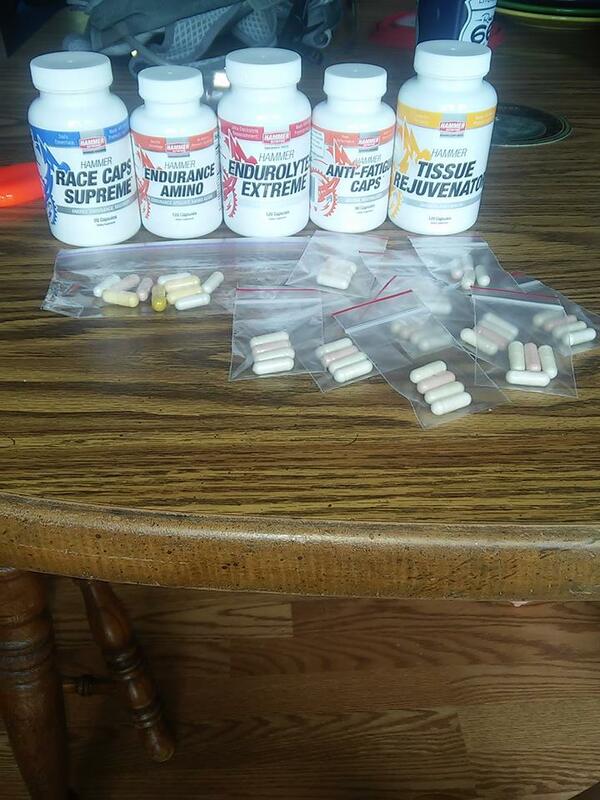 I also took these supplements each hour to keep me going: Endurolytes Extreme, Anti-Fatigue, Endurance Amino and Race Caps Supreme. Getting my nutrition ready before the race. OVERALL– A- Given how worried about this race I was and how brutal the conditions were, I’m very pleased with how it turned out. I was slower in all three disciplines than I planned, but everyone was that day. I ended up placing pretty well, as everyone had to suffer through the same conditions. I wanted to go beyond the 70.3 distance and have the confidence going into Boulder that I will be able to complete it and I accomplished those goals. I have a better idea of what my body thinks of the longer event and the extreme conditions and have about 8 weeks to continue to train and improve. What was a tough day is now a happy memory of a huge accomplishment! Congrats! You killed it! Nice. Thank you! It was a tough day, but I’m proud to have done it! Oh, I knew you would have been just fine Denzil! Though I can’t imagine the sweat angels you could have produced that day! I ran Kansas 70.3 in 2013 when it was still an Ironman event. It is a highly underrated course in terms of level of difficulty. The bike course is very hilly (I hated the dam(n) hill towards the end!) and the “rollers” going back into the park were crazy! I ran it on a year where the weather was better then average, and it was hot and windy with choppy waters and the run was brutally hot. Nice job on a tough course with brutal weather! Sounds like legends is having some growing pains and organizational issues. Hopefully it gets worked out down the road. The nice thing of the IM banner is that it is a well oiled machine with every detail worked out. Love the bling! Amazing results and good luck in Boulder! So nice to hear that the course is difficult in past years as well! The pre-race organization definitely had me worried, but I have to say, the actual race itself was pulled off beautifully, especially given the conditions. I probably should have mentioned that in my post! But somehow every aid station always had anything I could need or want, including ice! I am looking forward to my first Ironman branded event to see how it compares though.